Funny the way today’s so-called scene restaurants have gotten all warm and fuzzy and Danny Meyer-esque. It wasn’t so long ago, after all, that going to a scene restaurant was like entering a war zone. You booked a table at such an establishment at your own peril. On the day of reckoning, you approached the velvet-roped den of terror at 5:30 or 11 p.m. prepared for the worst. Upon your arrival, the host might look up from his host stand and recoil like someone who has seen a cockroach, or tell you that “you must not have made a reservation because it is not here in the book,” or that maybe you should come back tomorrow. Two hours later, you’d be seated next to the bathroom, but at least you knew where you stood: at the very bottom social stratum. And then there was the food, about which, of course, the less said the better. Still, there was a certain perverse comfort in the routine, and in the whole masochistic ritual. (Otherwise, why would you keep repeating it?) If your dignity survived the affront, it toughened you up and built your character. It was a New York rite of passage—like getting mugged on the subway. Imagine, then, how discombobulated a reservation-less Underground Gourmet felt upon entering certified scene restaurant Miss Lily’s Favourite Cakes (Miss Lily’s for short) one recent Friday night, only to be greeted by the statuesque host not like something the cat dragged in but rather like a long-lost childhood chum. This attitude, or lack thereof, extended to the servers, the bussers, the bartenders, the food runners—just about everyone involved in the baffling enterprise. The mood was festive, the old-school ska and reggae thumping at a lively but non-deafening decibel level, the multiculti, multigenerational crowd exuberantly gnawing on their spareribs (or, in the case of one well-heeled, sweater- tied-around-his-shoulders gent, carving at them with knife and fork like Elaine’s Snickers-eating boss on Seinfeld). On subsequent visits, the U.G. discovered that this egalitarian joie de vivre is par for the course at Miss Lily’s, and not, amazingly, confined to some VIP-ish section accessible through a secret passageway or trapdoor. You need not assume the worst about where you’re seated, although old habits die hard. We actually prefer the slightly less frenetic front room, a cheery pastel-hued update on a Caribbean-diner theme with pizza-parlor-orange Formica booths, luncheonette-style swivel stools, and a glass façade that opens to the street. Above the bar (which, in the absence of a full liquor license, makes do with sake and soju cocktails), plastic baskets are stocked with tropical produce like mango and dragon fruit that hint at the juice bar slated to open next door. In the darker, loungier back room, a disco ball hangs from the ceiling and vintage album covers line the walls and tabletops. Miss Lily’s island vibe comes courtesy of designer Serge Becker, who claims inspiration from outer-borough West Indian joints, not to mention, presumably, from Jamaica itself, where partner Paul Salmon runs the Rockhouse hotel. The team also includes a pair of Kosovo-born brothers turned nightclub doormen, and, ostensibly, the casting director who found the leggy, there-when-you-need-them floor staff who lope about the dining rooms like fashionably dressed giraffes. So the service at Miss Lily’s is warm and efficient and the décor charming, but how’s the food, you ask? Thanks to chef (or, more accurately, “consulting executive chef”) Bradford Thompson, like everything else, it’s much better than expected. Thompson, it turns out, is not only a Daniel alum, but also married into a Jamaican clan whose departed matriarch ran a jerk joint in Brooklyn and concocted an especially delicious jerk sauce. Thompson has re-created the recipe and launched a line of “Jule’s Gourmet” sauces, which makes Miss Lily’s a companion restaurant of sorts. Although we’ve yet to see him actually on duty in the open kitchen (he did drop in early one evening), his crew seems to have the menu down pat. Of the starters and sides served in bright-red plastic baskets, snack-bar style, we can heartily endorse the aforementioned pineapple-glazed pork ribs, the golden craggy codfish fritters, and the festivals, the Jamaican cornmeal fritters that look like a cross between a churro and a mini-baguette. Grilled corn on the cob makes its requisite appearance, as it does at hot spots from Café Habana to La Esquina, here spackled with toasted coconut, and much more delicious, we’re sure, had it been served hot. Skip the lackluster “jaquitos,” or Jamaican-themed tacos, and save your appetite for one of the entrées that really make Miss Lily’s a downtown destination. Among these we recommend the moist and meaty jerk chicken garnished with mango chutney, a truly sensational curried goat with a mouth-tingling heat, and a rich oxtail stew with bits of sweet potato and broad beans. All these dishes come with sides like rice and peas and spicy cucumber salads that are as good as you might hope for. The “Hellshire style” whole fried snapper with escovitch veggies is wonderfully fresh and tasty, too, if a bit overcooked one night. Jerk seitan, the star of the Vegan Bushman Plate, and a jerk pork burger, on the other hand, are proof that jerk seasoning can’t salvage everything. Despite the joint’s misleading official name, desserts are passable but not a strong suit. We do have high hopes, though, for the coming juice-bar annex, where LifeThyme’s cult juicer Melvin Major will hold forth. 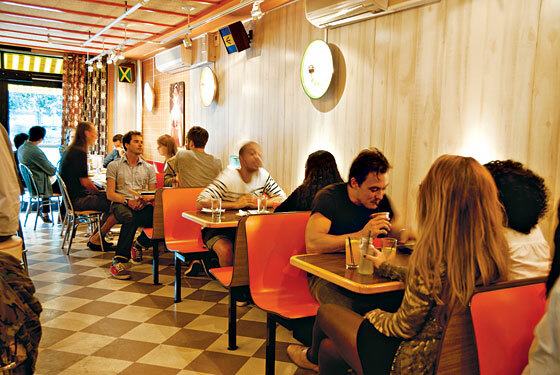 We hear rumors of Jamaican beef patties to go, too, which sounds more like the Underground Gourmet’s kind of scene—though the way things are going in the mixed-up scene-dining scene these days, you never know. Hours: Lunch daily 11:30 a.m. to 4:30 p.m. Brunch Saturday and Sunday 11 a.m. to 4:30 p.m. Dinner Monday through Saturday 5 p.m. to 1:30 a.m.; Sunday till 11:30 p.m.
Prices: Appetizers, $4 to $15; entrées, $15 to $29. Ideal Meal: Codfish fritters, pineapple-glazed pork ribs, jerk chicken, festivals. Note: In lieu of rum punch, try the Roots and Culture, a sherry cocktail spiked with fresh ginger juice. Scratchpad: Two stars for the unexpectedly tasty, straightforward Jamaican cooking, plus one more for the friendly service and festive vibe.